Venus and Serena Williams both overpowered their semifinal opponents to set up an historic family final in the US Open women’s singles. Serena Williams brushed aside top-seeded world No 1 Martina Hingis 6-3, 6-2 and then big sister Venus disposed of Australian and French open champion Jennifer Capriati 6-4, 6-2 yesterday to make tonight’s Grand Slam final a family affair. Wayne Band Kevin Ullyett scored Zimbabwe’s first-ever Grand Slam title winning the men’s doubles over Wimbledon champions Don Johnson and Jared Palmer 7-6 (11-/9), 2-6, 6-3 at the US Open. Russia’s Irina Slutskaya performs during the free skate competition at the Goodwill Games in Brisbane on Saturday. Slutskaya won gold ahead of her rival Michelle Kwan from the USA, with Japan’s Fumie Suguri bagging bronze. South Africa were in a dominant position after their first three batsmen made centuries and they then had Zimbabwe facing a battle to save the follow-on at the end of the second day of the first Test at Harare Sports Club here today. Sri Lanka crushed Bangladesh by an innings and 137 runs in their Asian Test Championship match today, but only after a century by debutant Mohammad Ashraful helped the visitors put up spirited resistance. Sri Lanka have “ridiculed” the game of cricket by retiring out two of their batsmen to give others a chance to practice, the state-run Daily News said today. “In their 124-year-old history, Test cricket has never been ridiculed as it was yesterday, when two Sri Lankan batsmen retired themselves out without being dismissed,” a report in the newspaper said. Hip-hop and gangsta rap came yesterday to the hallowed grounds of the Lord’s Cricket Club. The Compton Homies, from east Los Angeles, are on tour in England. One of the world’s top sprinters, Ato Boldon of Trinidad, tested positive to the banned substance ephedrine at a meeting in the USA earlier this year, the IAAF said today. Istvan Gyulai, general secretary of athletics’ world governing body, confirmed the positive test at a media conference in Melbourne. Ailing veteran athlete Capt Daljit Singh Grewal was operated upon today at Ram Saran Dass Kishori Lal Charitable Hospital for total knee replacement by orthopaedic surgeon Dr Shivinder Singh Sandhu. Talking to this correspondent in his room the gold medallist of Asian Games expressed his gratitude to Flying Sikh Milkha Singh who had brought in to focus his problem through newspapers. India’s champion golfer Mukesh Kumar of Mhow finally found his winnings ways, carding a superb 15-under par 273 to clinch the TNGF Open, the fifth leg of the Hero Honda PGA Tour, here this afternoon. Maharashtra’s Radhika Tulpule won her maiden international title beating Ipok Senoglu of Turkey 6-1 7-6 (7/2) in the singles final of the Indian Oil Servo ITF Women’s Tennis Championship here today. A sports academy with the assistance of the Centre will be set up in Himachal Pradesh at a cost of Rs 10 crore. Mr Parveen Sharma, Minister of State for Sports and Youth Services, said that with a view to promoting sports activities among the youth, one sports complex consisting of indoor and outdoor sports facilities would be established at each district headquarter at a cost of Rs 2 crore. N. S. Sodhi of the State Bank of India who is also former international hockey player has been appointed coach along with former Olympian Rajinder Singh for the Indian junior probables’ coaching camp being held at Hyderabad till September 30. Venus and Serena Williams both overpowered their semifinal opponents to set up an historic family final in the US Open women’s singles. Serena Williams brushed aside top-seeded world No 1 Martina Hingis 6-3, 6-2 and then big sister Venus disposed of Australian and French open champion Jennifer Capriati 6-4, 6-2 yesterday to make tonight’s Grand Slam final a family affair. “It’s sweet. It’s sweet. It’s really nice,’’ said 21-year-old defending champion Venus. “It will be great history,” said 19-year-old Serena. Today’s final, will be the first Grand Slam final contested by sisters since Maud Watson beat Lilian Watson 117 years ago in the first Wimbledon women’s final in 1884. The men’s semifinals will be played on Saturday afternoon. Fourth-seeded Australian Lleyton Hewitt meets seventh seed Yevgeny Kafelnikov of Russia, followed by third-seeded defending champion Marat Safin of Russia against 10th seed Pete Sampras in a rematch of last year’s final. Women’s day at the National Tennis Center provided a Williams family dream come true on Friday. The semifinal victories ensured the Williams clan of a third successive Open title as Serena won the crown in 1999 before Venus raised the trophy in triumph in 2000. The sisters advanced in different fashion as Serena sailed against the Swiss No 1, while Venus had a hard-hitting fight on her hands against Capriati. The fourth-seeded Venus had to battle back from 1-4 down in the first set, but the Wimbledon champion was up to the task. Venus, who squandered four break points against second seed Capriati in the opening game and two more in the fifth, finally broke through to put the set back on serve in the seventh game at 4-3 with a backhand drive down the line. Capriati saved three more break points from 0-40 in the ninth game but caved in under the Williams assault by netting a backhand pass and then netting a forehand to trail 4-5. Capriati, who could have taken over as world No 1 with a victory, made one last stand against Venus in a titanic 10th game that went to 22 points. Capriati saved three set points but failed to cash in any of five break points before two errors ended the game and set in Venus’s favour. That seemed to take the life out of Capriati, who played a defensive game against Venus. The first set took 52 minutes for Venus to capture, one minute longer than Serena needed to dismiss the Swiss as the younger Williams overwhelmed Hingis with an awesome display from the service line. The 10th-seeded Serena smacked 10 aces without a single double fault, and landed every first serve in the second set as she dropped just one point on serve in a stunning rout. Serena avenged three successive losses to Hingis in stunning style, winning 61 points against 33 in a contest that at times resembled an early round Grand Slam mismatch. Serena blasted 40 winners to just five from Hingis in a one-sided semifinal that made up for a quarterfinals loss to 20-year-old Hingis in their last match at the Australian Open. Early on, Hingis tried to induce errors by taking pace off her groundstrokes, but instead the American stepped in and cracked winners off both wings to lead the first set 5-1. The Swiss, who has not won a Grand Slam in more than two years since claiming the 1999 Australian Open title, switched gears and started hitting out as she pulled to within 5-3. But Serena finished off the threat and the set with three aces and a service winner in a love game. She maintained a virtuoso level in the second set, ending the match with a service winner, two aces and another service winner. The Williams sisters are best of friends, but they left no doubt that they both dearly wanted to win the crown. Venus leads her career series against Serena 4-2, including a semifinal default by Venus this year at Indian Wells. Black, a member of a family tennis dynasty, yesterday double-faulted on the 14-seeded duo’s first match point but made good on his second try as Johnson sent a backhand return out after nearly two hours. Meanwhile, Thursday night’s mixed doubles final, which ended with a victory for Australian top seeds Todd Woodbridge and Rennae Stubbs, ended in controversy thanks to a US Open-only modified scoring system. Instead of a third set, the mixed was reduced to a third-set tie-breaker. It was a move typical of the go-its-own-way US major, which also schedules its finals totally for the whims of domestic television and plays best-of-three instead of five-set doubles matches. There are also fifth-set tie-breakers, unheard-of at any other Slam. Zimbabwe were 143 for four at the close in reply to South Africa’s 600 for three declared. Once again, the host nation’s hopes rested with international cricketer of the year Andy Flower, who was on 54 not out. Jacques Kallis joined the South African run feast started by Herschelle Gibbs and Gary Kirsten, hitting an unbeaten 157 before skipper Shaun Pollock called a halt to the carnage with 41 overs left in the day. Zimbabwe were quickly in trouble as Alistair Campbell swung at a bouncer and was caught behind for nought, giving new cap Andre Nel a wicket with his fourth ball in Test cricket. Zimbabwe crashed to 51 for three before Dion Ebrahim and Andy Flower put on 82 for the fourth wicket. Bowling: Streak 34-4-120-0, Friend 27-2-147-2, Hondo 18-0-87-1, Price 42-2-192-0, Whittall 12-2-34-0, G. Flower 6-0-18-0. FOW: 1-2, 2-43, 3-51, 4-133. The 17-year-old Ashraful top-scored with a confident 114 before the visitors were finally bowled out for 328 to slip to their second successive innings defeat in the championship. Sri Lankan off-spinner Muttiah Muralitharan took five for 98 to finish with match figures of 10 for 111. Ashraful shared in a defiant fifth-wicket stand of 127 with Aminul Islam after Bangladesh began the third day’s play on 100 for four. The pair batted virtually right through the morning session before Islam was removed for a workmanlike 56. Islam, bowled around his legs on the stroke of lunch trying to sweep the slow left-arm of Sri Lankan captain Sanath Jayasuriya, hit seven fours in 152 balls. At the interval, Bangladesh still required a further 258 to make Sri Lanka bat a second time. Skipper Naimur Rahman, who made 48, then shared with Ashraful in a sixth-wicket stand of 96 until Sri Lanka took the second new ball. Ashraful was the more composed of the two batsmen, combining gritty defence with flashes of arrogance to reach his century in 188 minutes off 167 balls. Rahman, who had hit nine fours in 71 balls, was then removed in the 95th over when he holed out to Marvan Atapattu off the pace bowling of Ruchira Perera. Ashraful finally departed with the score on 308, hitting a return catch off Perera’s slower ball to end a stay at the crease of more than four hours, 212 balls and 16 boundaries. The tail folded quickly, though, as off-spinner Muralitharan came back into the attack and Perera finished with figures of three for 40. When play resumed today, Bangladesh seemed set for complete humiliation after being dismissed for 90 in their first innings and then allowing Sri Lanka to rack up a mammoth 555 for five declared. The ease with which Sri Lanka amassed their runs on the second day was underlined by the fact that two batsmen, Mahela Jayawardene and Marvan Atapattu, retired out after making 150 and 201, respectively. This is the first time that one batsman, let alone two, has retired out in a Test match. Bangladesh lost the opening match of the Asian Test Championship by an innings and 264 runs to Pakistan. The championship is being contested by only three teams because the Indian government refused to allow their side to play Pakistan in Lahore. FOW: 1-31, 2-54, 3-54, 4-81, 5-207, 6-303, 7-308, 8-308, 9-315. Sri Lanka have “ridiculed” the game of cricket by retiring out two of their batsmen to give others a chance to practice, the state-run Daily News said today. “In their 124-year-old history, Test cricket has never been ridiculed as it was yesterday, when two Sri Lankan batsmen retired themselves out without being dismissed,” a report in the newspaper said. Hip-hop and gangsta rap came yesterday to the hallowed grounds of the Lord’s Cricket Club. The Compton Homies, from east Los Angeles, are on tour in England. They stood on the hallowed pitch at the Lord’s — the home of cricket — and performed a rap song dedicated to the virtues of the genteel game. “From bullets to balls and gats to bats, from the streets of concrete to grass and mats, they’re playing cricket,” rapped brothers Isaac and Theo Hayes before the homies became the first American cricket team ever to play at the Lord’s. The history of the Compton Cricket Club couldn’t be further from the polite and proper image of the Lord’s. But that’s the point, says team founder, manager, player and social activist Ted Hayes. Ted Hayes, father of Isaac and Theo, has taken youngsters from the streets and gangs of Los Angeles and taught them cricket, hoping they adopt the sport’s etiquette. “Basketball, football, soccer, hockey, they have their rules and regulation, but cricket has this whole culture of etiquette,” Hayes said. Hayes, a tall figure with long greying dreadlocks, sports a traditional white cricket vest and white floppy hat on the pitch. His team eschew baseball caps and baggy trousers for light blue cricket pants and shirts donated by a local club, but many kept their bandannas on. The team members vary in age from teens to early 20s. Hayes’ sons created the rap song. The Homies are on their third tour to England. So far, they have played Lashings, a team which includes former West Indies greats Brian Lara and Richie Richardson, the Australian Aboriginals and the Royal Household among others. The side notched up its first win, against Hamilton, on Thursday, winning by four runs. The core of the team travelled to England two years ago, and this time only four of the 14 members are new. The Homies played against Taverners yesterday, which included former England cricket captain Mike Gatting. 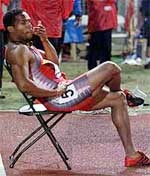 Ato Boldon from Trinidad sits in a chair after finishing a disappointing fourth in the 100 metres race at the Goodwill Games in Brishbane on September 5. One of the world’s top sprinters, Ato Boldon of Trinidad, tested positive to the banned substance ephedrine at a meeting in the USA earlier this year, the IAAF said today. Istvan Gyulai, general secretary of athletics’ world governing body, confirmed the positive test at a media conference in Melbourne. But Boldon (27) will not be suspended as the offence is only punishable by a public warning and disqualification from the meet. “Yes I can confirm it because it is no longer confidential,” said Gyulai when probed on rumours of a positive result. “There was a positive one and a surprising result in May. And that is Ato Boldon. It was ephedrine and I was informed yesterday (Friday). “But that was not a two-year (ban) policy, it was a stimulant which caused disqualification from that particular competition and a public warning. Boldon returned the positive test after running a season best 20.76 in the 200m at Walnut, California. He could not be reached for comment today and is thought to have left Australia. Gyulai, however, deflected blame from the Trinidadian, blaming poor labelling on food supplements and medicines. Ephedrine is commonly found in cough and hay fever medicines which can be brought over the counter at a chemist. Ailing veteran athlete Capt Daljit Singh Grewal was operated upon today at Ram Saran Dass Kishori Lal Charitable Hospital for total knee replacement by orthopaedic surgeon Dr Shivinder Singh Sandhu. Talking to this correspondent in his room the gold medallist of Asian Games expressed his gratitude to Flying Sikh Milkha Singh who had brought in to focus his problem through newspapers. Dr Sandhu and his team of doctors thoroughly examined Capt Daljit Singh and replaced his right knee first and after watching his progress, they will perform the second replacement of the left knee within the next one month. Dr Sandhu said the hospital would bear all his expenses, including laboratory tests, medicines, accommodation and other charges while an implant of Swiss make would be used. The doctor added that the manufacturers of the implant had offered to subsidise the cost of the same. He was hopeful that Daljit Singh would be able to walk without any pain in the next few days. Capt Daljit Singh Grewal of Sikh Light Infantry retired from active service in 1982 and has been suffering from knee problem for the past five years. He added that he was initially treated at Chandigarh where the doctor managed to realign his joint but the pain persisted. Capt Daljit Singh’s son, who has accompanied his father expressed his gratitude to the doctors in the hospital for enabling his father to walk again without pain. With the ‘southern swing’ coming to an end (five events in South India), Mukesh Kumar, aided by a final round score of four under 68, took home the winner’s cheque of Rs 1,62,000 and another Rs 10,000 from the Tamil Nadu Golf Federation for setting a course record. Sanjay Kumar of Lucknow was second with eight-under 280. Earlier, the top seeded pair of Sai Jayalakshmi and Rushmi Chakravarty defeated Subha Srinivasan and Samrita Sekar 6-0 7-6 (7/2) to clinch the doubles title. Tulpule displayed solidity in her ground strokes against a better rated Senoglu, and had no difficulty in taking the first set. But she looked to be wilting under pressure, as her rival picked up momentum mid-way through the second set. Tulpule was well in command as she took a 4-2 lead and then 5-3 before Senoglu, like in her earlier games, fought back and sent down winners on both the flanks. Senoglu was also serving well and, in fact, went on to lead 6-5. But Tulpule played some superb backhand strokes and kept her cool to wrest the 12th game and take the set to the tie-break. Tulpule then tightened her game and also came to the net to score winners. Besides, a few unforced errors by Senoglu also helped her to wrap up the match. A sports academy with the assistance of the Centre will be set up in Himachal Pradesh at a cost of Rs 10 crore. Mr Parveen Sharma, Minister of State for Sports and Youth Services, said that with a view to promoting sports activities among the youth, one sports complex consisting of indoor and outdoor sports facilities would be established at each district headquarter at a cost of Rs 2 crore. To promote rural sports, one rural school in each block will be given a one time grant of Rs 1.50 lakh for creating the infrastructure. Mr Sharma said to boost sports activities in a big way, the Centre had sanctioned projects worth Rs 10.9 crore last year for constructing a Rs 99 lakh sports hostel at Bilaspur, Rs 2.42 crore indoor stadium and sports hostel at Una, Rs 1.42 crore indoor stadium at Dharamsala, Rs 47 lakh indoor stadium at Mandi, Rs 1 crore indoor stadium at Solan, Rs 1.27 crore indoor stadium at Hamirpur and Rs 45 lakh indoor stadium at Tauni Devi in Hamirpur district. An amount of Rs 92 lakh has been granted by the Centre for improvement of the Shimla ice skating rink. A sports policy has been formulated for the first time in the state. This has been structured with a view to providing job opportunities to outstanding sportspersons and many other categories have been included to benefit outstanding sportspersons. He said the state government had doubled the amount of cash awards for those excelling in the sports at the international, national and state levels. Sportspersons securing the first three positions in individual events at the international level will now be given cash awards of Rs 1 lakh, Rs 60,000 and Rs 40,000, respectively. Those securing the first and second positions in team events (each player) will get cash award of Rs 40,000 and Rs 30,000 respectively. 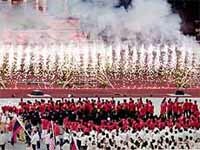 At the national level sportspersons will get Rs 20,000, Rs 10,000 and Rs 6,000 for the first three positions. Awards of Rs 4,000 and Rs 2,000 will be given to the winners of the first two positions in team events in any senior national championship. The state government has also raised reservation quota in jobs for outstanding sportspersons from 1 per cent to 3 per cent which will be applicable to all departments, corporations, boards and universities. The government has also appointed 40 new coaches on contract basis. The camp is being held in preparation for the Indian junior hockey team for the Junior Hockey World Cup to be held at Hobart, Australia, from October 9 to 25. Sodhi is also joint secretary of the Chandigarh Hockey Association and the Rock Rovers Club. 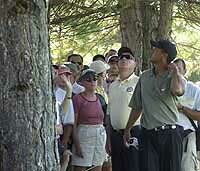 Tiger Woods (R) looks up into a tree for his ball at the Canadian Open in Montreal, on Friday. Woods could not find it and had to take another tee shot. Woods finished the day at two under par.